Everyone loves to see this woodpecker. You cannot miss its striking red head with black and white streaked face and black body! Standing at 16 to 19 inches and with a wing span of 26 to 30 inches you will definitely know it is the Pileated Woodpecker. Mostly you will encounter one in a wooded setting as it likes to forage (usually at the base of trees) around dead wood lying on the ground, in stumps, or in a standing dead tree. They hunt for carpenter ants, beetles, and termites which is their main diet. You will know if a Pileated has been around as it drills a rectangular size hole which can be up to a foot or more long and fairly deep. However, you can attract Pileated Woodpeckers to your yard as they are known to come into suet feeders especially in the winter. I actually have been lucky enough to get them in to my suet feeders in summer too. Of course there are a few other things that you can do to attract Pileated Woodpeckers. Read on……. There are different types of suet that you can feed the birds at different times of the year. It is a great energy source for them as suet contains fat. You can feed the birds suet all year long whether it be to help them keep warm in winter or to take care of their offspring in spring and summer. Pileated Woodpeckers will eat any type of suet but prefer the ones with peanuts or peanut butter in it as I have found. I have had them come in to my feeders at my former house that was on a wooded setting and also in the subdivision where I currently live (some woods across the road and on the other side of the subdivision). 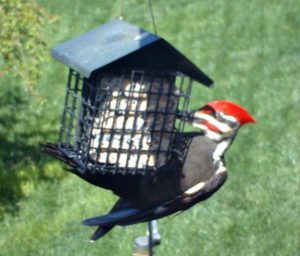 If a Pileated is in the area and you have your suet feeder out there is a likely chance that you will get one to your feeder. Mind you we are consistent with providing suet to the birds all year long but even if you have it out during the fall and winter months only, you can attract Pileateds to your feeder. NOTE: There are Pileated Woodpecker suet feeders available for purchase that have a longer board for the Pileated to be able to hang better (top photo) but they really aren’t picky if you have good suet for them. As you can see in the second photo that mine works just fine for them. When we lived in a wooded setting on six and a half acres we used to leave dead or deteriorating trees, dead wood, or logs alone as we knew that the woodpeckers would be attracted to them for their diet of carpenter ants, beetles, and termites. If you live on a little bit of land such as we did and you do not mind the rustic look then you will probably get a Pileated or two in your yard. 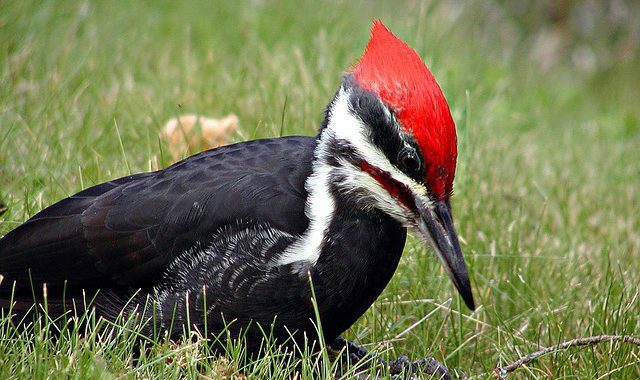 Pileated Woodpeckers build their nest in the cavities of trees in mature forests. 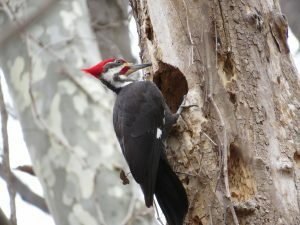 There are nesting boxes that you can make or purchase specifically for Pileated Woodpeckers but they do not have a great history of utilizing them. If you live near a more mature forest or wooded area you may get lucky enough though. Just keep in mind that other birds or animals may make residence in it too. It is the largest woodpecker found in the United States and stands at 16 to 19 inches with a wing span of 26 to 30 inches. Pileated Woodpecker, (pronounced either Pie-lee-ated or Pill-ee-ated as found in the dictionary). People argue about this all the time. 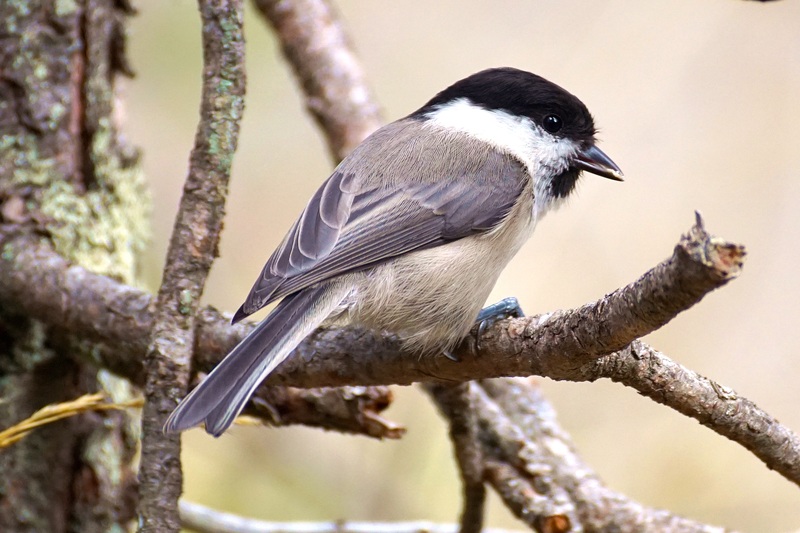 Other birds and mammals use the nest holes that Pileateds make as shelter such as owls, ducks, swifts, pine martens, and bats. Pileateds are monogamous. The male chooses the nest which usually a mature tree cavity and builds most of it. It can take up to 6 weeks for a nest to be built for Pileateds. Females generally lay 4 eggs but a clutch can be up to 6 eggs. The Pileated Woodpecker defends its territory year round. To fend off any intruders it will use vocalizations and drumming on hollow trees. Pileateds have long barbed tongues to be able to extract its food from wood. They sometimes use telephone poles and power lines to make their nests. These woodpeckers make vertical holes in dead trees which are unique to them. Their call is easy to identify and so is their drumming! Pileated Woodpeckers are always fun to see in the wild. You will definitely know when you see one with their bright red tufted head, black and white streaks on and along its neck and black body. Not only in sight but you may also hear their loud calls or very loud drumming on hollow trees. If you want to attract them to your yard the best way is to put out suet for them. Peanuts, peanut butter, and fat renderings are all a draw for them. If you have a woods nearby you might also want to try putting a nesting box out for them. They may or may not use it but it is worth a try. 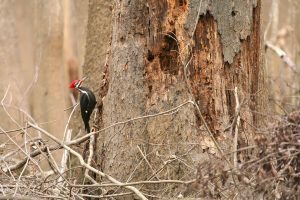 Also, if you don’t mind a few dead logs or dead trees on your property, Pileateds will be attracted to them as they like to peck at them to get to their favorite food of carpenter ants, beetles, and termites. Have anything to add to this? Let me know what you think or if you have had your own experiences with Pileated Woodpeckers. Feel free to comment below. Really enjoyed reading your article about Pileated Woodpeckers. I live in the UK and although we have some species of woodpecker here we don’t have Pileated Woodpeckers. After reading your article and seeing the photos here I wish we did now! What a beautiful and very distinctive bird. Are they only found in America or other parts of the world do you know? Lorna, Pileated Woodpeckers are found in eastern North America, the Great Lakes, and parts of Canada and parts of the Pacific coast. They are a very interesting woodpecker to watch too. Just last Sunday we were lucky to get one at our suet feeder. We haven’t had one visit in a while so my husband and I were pretty pumped about that. Thanks for your comment. I will have to check in to the types of woodpeckers that you get in the UK. I’m sure yours are just as cool! What a lovely post about Pileated Woodpeckers! My husband and I live in a ranch home, and we can hear a woodpecker from time to time hanging on our front tree, especially during the nicer days. I never knew about the different kinds of Woodpeckers though, I will pay more attention next time I hear one to see if it’s a Pileated. And 26-30 inches, that’s a big wingspan, super cool! Now I am really considering on getting a suet. Should we be concerned about woodpeckers messing with our wooden deck? Xiadana, the only reason that you would have to worry about your deck would be if you have an ant problem. Woodpeckers like those. You would then just have to treat it to get rid of the ants. You would be surprised as to all the different species of woodpeckers there are. 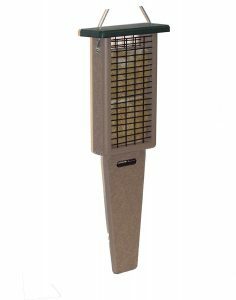 All of them are great to have in your yard as far as I’m concerned and having a suet feeder will definitely bring them in.